Royal Palace is a Royal residence located in the splendid city of Phnom Phen, Cambodia. The Royal Palace of Cambodia is a fine example of Khmer architecture with slight French touch architectures. It is a beautiful palace which is divided by walls into four main compounds. The southern compound is adorned with the Silver Pagoda, the northern side encompasses the Khemarin Palace and the central compound houses the Throne Hall, which is used even today for religious and royal ceremonies as well as a meeting place for guests of the King. Angkor Wat is one of the largest religious monuments in Cambodia. Located in the majestic city of Siem Reap, it was designated as the UNESCO World Heritage Site 1992. Angor was once the capital city of the Khmer Empire and encompasses thousands of temples. The Angor Wat temple features a high classical style of Khmer architecture. It was built by the Khmer King Suryavarman II in the early 12th century. Originally it was built as a Hindu temple dedicated to the Lord Vishnu, and later it was converted into a Buddhist temple in the 14th century. It is one of the most beautiful tourist attractions in Cambodia. One of the most beautiful tourist attractions in Cambodia, Sihanoukville is a splendorous coastal city located in Cambodia. The city features plenty of things to do and see for the visitors. 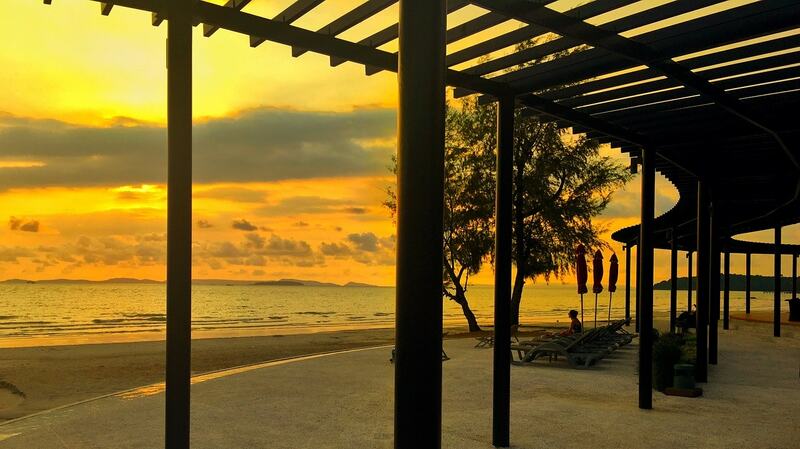 But, the main attraction in the city is an array of topmost sandy beaches that Sihanoukville offers to the visitors. From cheap accommodations, food, and drinks, combined with the family-friendly atmosphere the beaches provide the best experience to the visitors. Some of the most fantastic and popular beaches in the city include Otres Beach, Sokha Beach, Victory Beach, Independence Beach, Ochheuteal Beach, Serendipity Beach and much more. Boo Sra Waterfall, popularly known as Bonsraa Waterfalls, is a fantastic waterfall located in the Mondulkiri Province of Cambodia. It is one of the most beautiful and most popular tourist attractions of Cambodia. The waterfall is mainly popular due to its triple-tier drop. This triple-tier drop waterfall has an upper tier of about 12 meters, a lower tier of about 20m drop and the last tier is about 4 meters. Bou Sra waterfall is an iconic waterfall that offers panoramic views to the visitors from the amazing platform which is located just in front of this exquisite waterfall. Preah Monivong National Park is an adventurous national park located in the Kampot Province of Southern Cambodia. It is also known as Phnom Bokor National Park. The park encompasses an area of about 982 square miles, covered with lush green evergreen rain forests. The park is home to several exotic species of fauna. Among the wide variety of wildlife in the park are Asian elephants, Indo-Chinese tigers, leopards, Asiatic black bears, different kinds of deer, and many, many more. The park also features almost 300 bird species. However, the main attraction in the Preah Monivong National Park is the old French hill station at an elevation of about 1,080 meters, which is also known as Bokor Hill Station. The wonderful Independence Monument is one of the most striking and iconic landmarks that dominates the majestic city of Phnom Penh. Independence Monument was built in 1958 as a memorial and to commemorate Cambodia’s independence from France in 1953. The 20-meter high monument is shaped in the form of a lotus, which can also be seen from Angkor Wat and other Khmer historical sites. There is a big open park at the Independence Monument which is a popular spot for visitors. At night the monument is lit with blue, red and white lights that symbolise the colours of the national flag of Cambodia. The enchanting town of Battambang, located just few kilometers far away from Siem Reap, is often overlooked by travellers, but the city has hidden charms to offer for the visitors. About 11km outside of Battambang town is a beautiful mountain, which is home to thousands and thousands of bats that leaves the cave as dusk falls, creating a steady stream flying out for around 45minutes that provides spectacular experience to the visitors. Tuol Sleng is a Genocide Museum located in Phonm Phen, the Capital city of Cambodia. Tuol Sleng which means “Hill of the Poisonous Trees”, is a former high school which was used as Security Prison 21 (S-21) by the Khmer Rouge regime from 1975 to 1979. The site has four main buildings, known as Building A, B, C, and D. Building A has large cells in which the bodies of the last victims were discovered. Building B has galleries of photographs. Building C is sub-divided into small cells for prisoners. Building D has other memorabilia including instruments of torture. The museum is open to all visitors and they can easily access the museum from anywhere in Phonm Phen. Prasat Preah is an ancient Hindu temple which was built during the Khmer Empire period. Situated at the top a 525-metres high cliff in the Dangrek Mountains, in the Preah Vihear province, Cambodia, the Temple of Preah Vihear is dedicated to Lord Shiva that attracts visitors from all over the world. The temple has a pleasant environment with spectacular views for the visitors. The Prasat Preah Vihear was also declared as the second UNESCO World Heritage Site after the Angkor Archaeological Complex in 2008. The Tonle Sap, a Great Lake flowing in Cambodia, is the largest freshwater lake in Southeast Asia. The Tonle Sap River connects with the River Mekong at Phnom Penh, Cambodia. It is also called Boeung Tonle Sap, and houses one of the most vibrant ecosystems in the world, with many different species of wildlife in and around the lake. It is also famous for its fascinating local communities and their floating villages. This massive lake is as much as 250 km long and 100 km wide, making it seem like an inland ocean as it is impossible to see the opposite shore from ground level. These are the top 10 tourist attraction of Cambodia. Do post your comments.